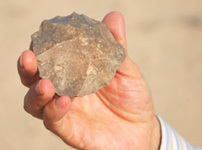 Human activity in Abu Dhabi dates back to the Old Stone Age. Archaeological discoveries in the years leading up to 2007 included stone artefacts which had been created by the Levallois flint-knapping technique in the Palaeolithic period. An important discovery of archaeological finds from the Palaeolithic in Abu Dhabi was announced in 2007 by Mohamed Khalaf Al-Mazrouei, director general of the Abu Dhabi Authority for Culture and Heritage. The finds were identified by a team from the authority and two visiting scholars. The discovery included stone artefacts from the Levallois technique, a sophisticated industry which was popular during the Old Stone Age, appearing within the Mousterian culture. Due to the importance of this discovery, the Abu Dhabi Authority for Culture and Heritage began participating in the Seminar for Arabian Studies, which was to be held at the British Museum between 19 and 20 July 2007, where the discovery was to be discussed with international scholars. Several papers dealing with Arabia's Palaeolithic period would also be presented at the seminar. Dr Walid Yasin, manager of the Archaeology Division at ADACH, picked up the first distinctive artefact from one of the ancient sites in the Western Province of Abu Dhabi. He reported that a number of flint cores and flakes of the Levallois technique had been collected from the site. Artefacts of this manufacturing technique were first discovered in the nineteenth century at the archaeological site of Levallios, near Paris. Today, similar artefacts are known from Europe, Africa, and Asia. In the Near East they are usually associated with Neanderthal man and the crossover period when anatomically modern humans were beginning to inhabit the region. The dating of Abu Dhabi artefacts according to Dr Ghanim Wahida, a pre-historian who is a specialist in this period from Cambridge University, is however estimated to fall in the Middle Palaeolithic (150,000-35,000 years ago) - still part of the Mousterian, but right at its very end. Dr Yasin underlined the significance of this major discovery: 'lies in the fact that it alters our understanding of the beginning of first human activities in Abu Dhabi which seem to go back to the Old Stone Age, as opposed to the New Stone Age some 7,500 years ago'. It should be also noted that the Western Province of the emirate of Abu Dhabi revealed fossils of mammals from the Late Miocene period (between six to eight million years ago), together with evidence of an ancient river, which indicated a prevailing a wet climate. Images and text copyright © Middle East Online. No breach of copyright is intended or inferred.